IDEAS-Watersheds integrates standalone siloed codes into an interoperable software ecosystem using common computational libraries and frameworks to share capabilities and advance computational watershed science. Alquimia is a biogeochemistry Application Program Interface and wrapper library that provides unified access to biogeochemistry capabilities from mature geochemical codes, allowing any subsurface flow and transport simulator to access a range of functionality. Alquimia is not an implementation of a biogeochemistry reaction library and does not do any geochemical calculations. It provides unified data structures and subroutine signatures so that existing geochemical codes perform these calculations. Currently, Alquimia provides access to the geochemical codes PFLOTRAN and CrunchFlow and can be used for the simulation of aqueous complexation reactions, radioactive decay, ion exchange, surface complexation, and mineral dissolution-precipitation. The Advanced Terrestrial Simulator (ATS) is a code for solving ecosystem-based, integrated, distributed hydrology. It builds on the multi-physics framework and toolsets (mesh infrastructure, discretizations, solvers) provided by Amanzi and is a key driver of development of the flexible multiphysics framework Acros. Capabilities are largely based on solving various forms of Richards equation coupled to a surface flow equation, along with the needed sources and sinks for ecosystem and climate models. This can (but need not) include thermal processes (especially ice for frozen soils), evapo-transpiration, albedo-driven surface energy balances, snow, biogeochemistry, plant dynamics, deformation, transport, and much more. It is unique in its thermal integrated hydrology capabilities, which includes thermal energy with freeze/thaw processes in both the surface and subsurface water, and its reactive transport capabilities, which are also coupled in both surface and subsurface water. ATS is jointly developed by LANL, LBNL, and ORNL as an open source project under the three-clause BSD license. CrunchFlow is an open-source software package for simulating reactive flow and transport applied to a variety of problems in the Earth and environmental sciences that can include an arbitrary number of reactions, including mineral dissolution/precipitation, ion exchange, surface complexation, and microbially mediated reactions (Steefel et al, 2015). Two approaches are available at runtime for coupling reactions and transport: (1) a global-implicit approach that solves transport and reactions simultaneously, and (2) an operator-splitting approach based on a sequential non-iterative solve. LaGriT is a software tool for generating, editing and optimizing multi-material unstructured finite element grids; it also maintains the geometric integrity of complex input volumes, surfaces, and geologic data and produces an optimal grid (Delaunay, Voronoi) elements. The data structures used in the code are compact and powerful and expandable to include hybrid meshes (tet, hex, prism, pyramid, quadrilateral, triangle, line), however the main algorithms are for triangle and tetrahedral meshes. The LaGriT tools are used in many projects including ASCEM meshing for Amanzi, Discrete Fracture Networks (DFN), Arctic Permafrost, and Subsurface Flow and Transport models using FEHM and PFLOTRAN. PyLaGriT provides a python interface to LaGriT capabilities, making it easier to incorporate mesh generation in modeling workflows. ParFlow, the integrated watershed model, solves saturated and variably saturated flow in three dimensions using either an orthogonal (Jones & Woodward, 2001; Kollet & Maxwell, 2006) or a terrain-following, semi-structured mesh that enables fine vertical resolution near the land surface and deep (~1 km) confined and unconfined aquifers. ParFlow models dynamic surface and subsurface flow solving the simplified shallow water equations implicitly coupled to Richards’ equation; this allows for two-way exchanges and intermittency in stream and river flow (Kollet & Maxwell, 2006). ParFlow uses robust linear (Ashby & Falgout, 1996) and nonlinear (Jones & Woodward, 2001; Osei-Kuffuor et al., 2014) solution techniques and exhibits efficient parallel scaling to large processor counts, more than 450K cores (Kollet et al., 2010), enabling very large-extent simulations with fine spatial resolution. ParFlow-CLM, ParFlow coupled to the land-surface model CLM (Ferguson et al., 2016; Jefferson & Maxwell, 2015; Jefferson et al., 2017; Reed M. Maxwell & Miller, 2005), provides a comprehensive representation of vegetation, snow, and land-atmosphere water and energy fluxes. CLM is unique in the land surface modeling community because it is a module that is called from within ParFlow. This modeling framework has been shown to represent the observed range of temporal scales and non-stationary behavior (R. M. Maxwell et al., 2015) making it appropriate for the proposed work. A 1 km lateral resolution ParFlow-CLM model of CONUS has been developed and used to evaluate large-scale controls on groundwater configuration and connections between lateral groundwater flow and land-surface partitioning (Laura E. Condon & Maxwell, 2015; L. E. Condon & Maxwell, 2017; Reed M. Maxwell & Condon, 2016; R. M. Maxwell et al., 2015). ParFlow-CLM is currently distributed with ParFlow through the GitHub repo. 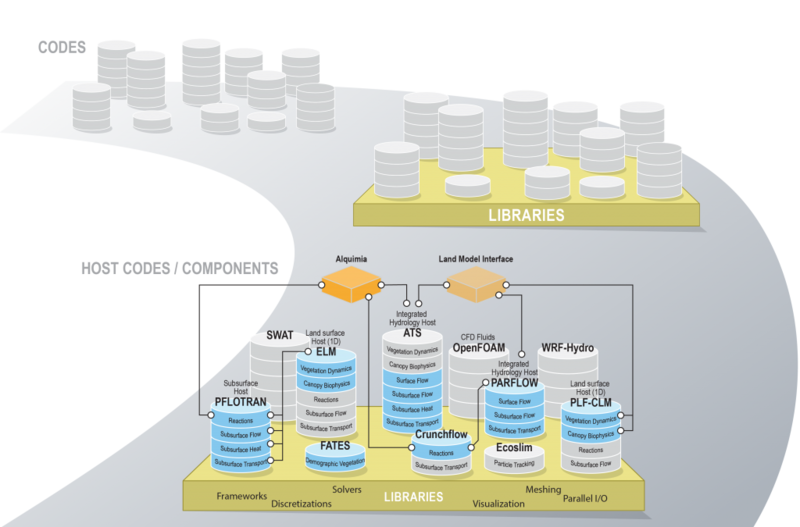 In the IDEAS project the CLM land model interface will be generalized and also be made available as a separate library that other codes in the eco-system can connect use still within the ParFlow GitHub repo. PFLOTRAN is an open-source, state-of-the-art massively parallel subsurface flow and reactive transport code. PFLOTRAN solves a system of generally nonlinear partial differential equations describing multiphase, multicomponent, and multiscale reactive flow and transport in porous materials. The code is designed to run on massively parallel computing architectures as well as workstations and laptops. PFLOTRAN is written in object-oriented, free-formatted FORTRAN 2003. The reactive transport equations can be solved using either a fully implicit Newton-Raphson algorithm or the less robust operator-splitting method. Geochemical capabilities include aqueous complexation, sorption, mineral precipitation and dissolution, and microbially mediated reactions.